Do you work as a professional in a field that is related to health and vitality (body, mind, spirit, emotions, environment, community)? Do you currently blog in a vitality genre including Body, Mind, Spirit, Emotions, Community, Environment? Vitality Advocates is a community site and content distribution network regarding all things vital. We publish both original and re-posted content that meet our quality standards. Would you be interested in receiving information in regards to becoming a contributing author for Vitality Advocates? We created a 30 Day Gratitude Challenge to support your journey toward optimal vitality. Participants will receive a daily inspirational image and quote together with their daily gratitude journal in their inbox to kick-start a positive day. 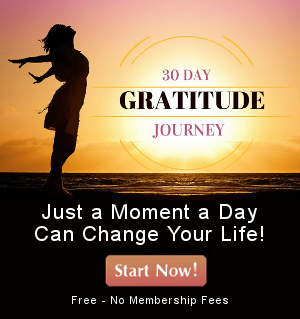 Would you like to register for the 30 Day Gratitude Challenge?